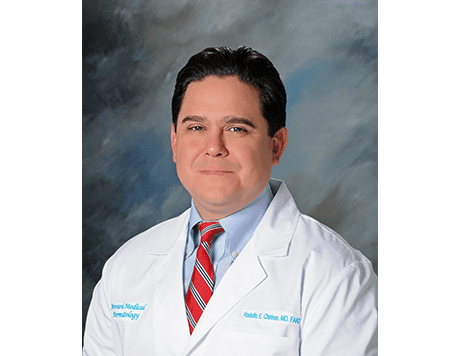 Brevard Medical Dermatology Providers Rodolfo Chirinos, M.D. Rodolfo Chirinos, M.D., F.A.A.D., is a top-ranked dermatologist providing skilled care for patients in and around Brevard County, FL. At Brevard Medical Dermatology in Titusville and Melbourne, FL, Dr. Chirinos offers complete dermatologic care for acute and chronic issues, including acne, skin cancer, eczema, warts, dermatitis, psoriasis, moles, skin rashes, basal cell carcinoma and squamous cell carcinoma. Certified by the American Board of Dermatology and a fellow of the American Academy of Dermatology (F.A.A.D. ), Dr. Chirinos received his medical degree from Universidad Central del Caribe School of Medicine. Dedicated to ensuring each patient receives the most appropriate and effective care, he maintains active memberships in several medical societies, including the American Society of Dermatologic Surgery, the International Society of Dermatology and the American Contact Dermatitis Society, with extensive experience in the treatment of simple and complex dermatologic issues as well as advanced dermatologic surgery. When not caring for patients, Dr. Chirinos enjoys deep-sea fishing and spending time with his family.